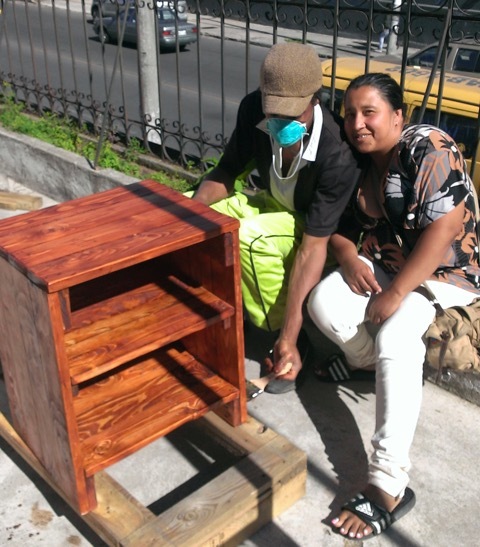 Story update: Fast forward less than one year, and the guys in the Quito Dump Community Men’s program are producing some stellar furniture. Check out this set below. Notice the recycled pallet wood. How awesome is this? When you support ER, you support vulnerable families who are trying to escape generational poverty. Thank you for your help. 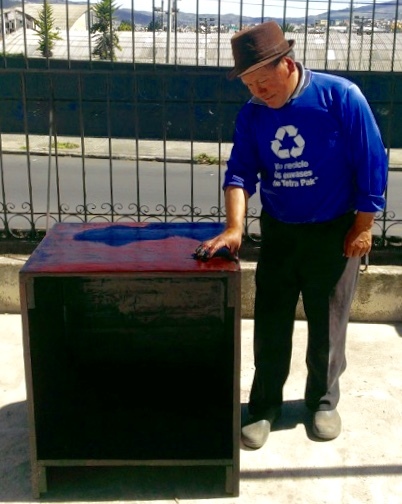 How do you inspire hope among men who recycle from the trash? Most of these recyclers grew up in abusive conditions at home and while recycling. What can be done to build trust and positively impact their lives? 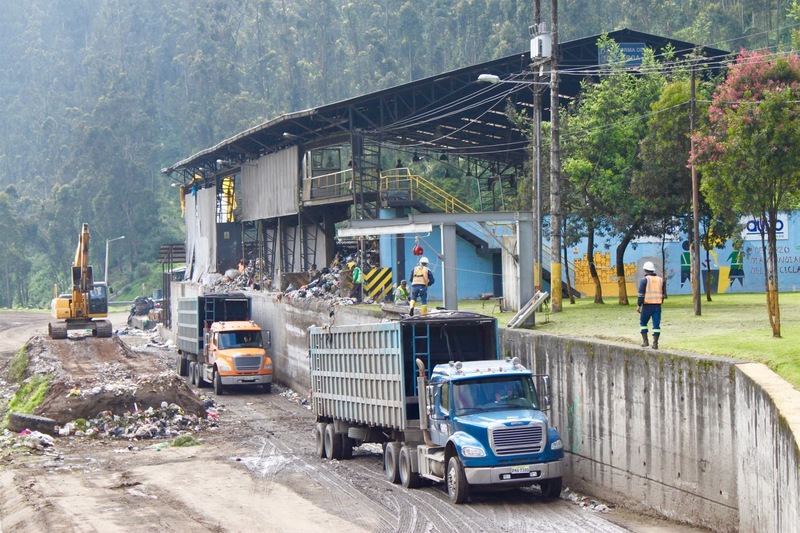 One exciting development is the growth of the Quito Dump Men’s program, which has moved back to the Dump – AKA Zambiza Garbage Transfer Station. The group now meets in a well-stocked workshop. The workshop is just few hundred yards from the garbage station, making it easy for the men to participate. ER’s Pete Emery and Jose Jimenez are overseeing the program. It now meets twice a week. The men are tackling bigger projects, including building bunk beds, highchairs, tables and cabinets. They furniture is built primarily from pallet wood, which is usually obtained for free. Volunteer Dave Tippett has been a huge help! The program has benefitted greatly from tools and equipment donated by a church. The men recently built a closet to protect the tools. In the last few months, the men have learned electrical skills and helped to install the electric power to the workshop. 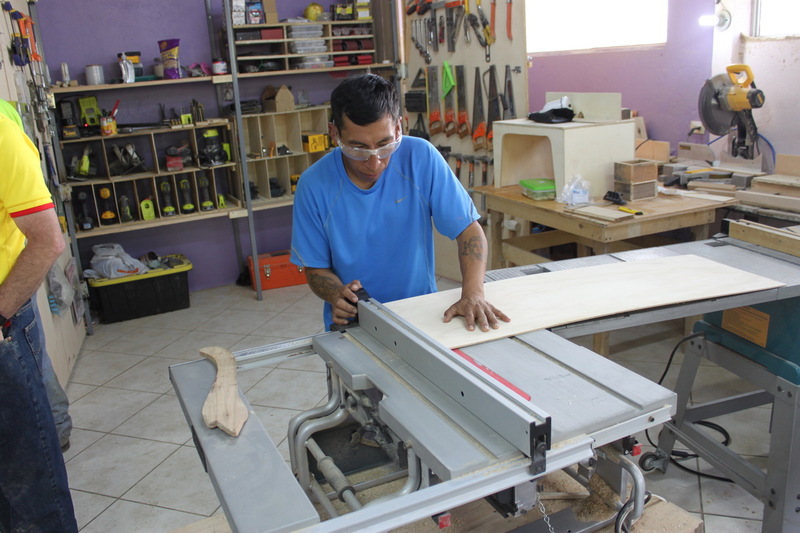 The program has benefitted from volunteer Dave Tippett, who has been working with the men during the last month to help them finish their furniture-building projects. Dave’s availability has allowed the workshop to be open for extended hours. Many thanks to all the supporters who have donated to the Quito Dump Men’s Program! Want to help the Quito Dump Men’s Program continue to grow? Click here to donate. ER has served people in Quito, Ecuador for 20 years. We’ve seen first-hand that women and children often bear the brunt of poverty. That’s why we operate a child development center, after-school program and a women’s program through the Quito Dump Project. But what about the men? Although we focus on helping the most vulnerable in the Quito Dump community – women and children – that doesn’t mean we’ve given up on men. We know they care deeply for their families and want to be better leaders. We’re committed to helping them become better husbands, fathers and providers. One way we are doing that is through a monthly men’s program. We’ve been meeting at the Quito Family Resource Center (QFRC) to study, encourage each other and learn basic building skills. But the QFRC is inadequate for our projects. There’s just not enough room to store pallet wood, tools and furniture. However, we recently got some great news. The government agency that oversees the Quito Dump, where many of the men work as recyclers, asked us to open a training facility on the Dump property. We jumped at the opportunity and set up a workshop on the Dump grounds. We’ve started a training program with a few guys as a trial and we’ll open it up to more recyclers as we launch the program officially in the weeks ahead. We’ll offer the program free for now, but we may have to charge for specialized training down the road. We knew if we could teach men to use their hands to create something useful they would discover their potential to do more than recycle from the trash. But without a budget for supplies, how could we begin? That’s when it hit me. Pallets are a great source of wood and are frequently discarded. So I researched pallet projects and discovered you can build all types of furniture using these cast-offs. We’ve done some projects at our men’s club and the impact has been tremendous. The men practically glow with pride when they begin to realize their potential. We will start the new training at the Dump with a pallet project. My goal is to begin with pallet projects and expand to other training such as electrical, plumbing, welding, cleaning and construction. There will also be times set aside so the men can fix things they find in the trash like toys, furniture and appliances. My plan is to have regular shop hours when we will be open. The men’s program will run as usual on Thursday from 8 a.m.-11 a.m., but ideally we would open the shop two other time during the week. Over time, we’d like to hold meetings, provide counseling and establish an adult education program. To build the sense of community among the men, we’ll also consider adding dinners, movies and sports. My goal is that as these guys become proficient in a skill, they will graduate, get a diploma and receive some tools to help them get started on their own. I also plan to see if we can find businesses that will give them a chance at a job. To accomplish all of this, we face some challenges. I need someone to manage the shop when I’m not there. I also need help with funding so we can purchase tools, nails and screws, wood, glue, sandpaper, varnish, sanding disks and more. We had a one-time gift for tools donated by a church, but it is depleted. Ideally, we would receive monthly donations to keep this program running. On the bright side, we got all the permissions signed from the municipality. That’s a huge step and it only took five months. Ha! This is so much bigger than a training program. It gives us a presence again in the transfer station (Quito Dump) to better serve the people there. Many of the men in the Dump community have been broken by substance abuse, a lack of education and opportunity and relationship problems. But by investing in these guys, we’ve seen that they are redeemable. One example is Orlando. His wife had left him because his drinking and abusive behavior, which was too much for her. She just moved back in with him because he has changed so much. He is famous for being one of the worst guys in the Dump. He used to come high and drunk, but is slowly getting much better. He has a new perspective and hope. Oscar is another guy who is progressing. He already saved up and bought himself his own grinder so he can keep working on projects at his home. And then there’s Sandy. He has sold a few of his projects and has a list of orders. When he started he could hardly draw a straight line even with a square. Today his wife is so proud of him she was in tears the other day. We need help with our Quito Men’s program. We need tools, supplies and project funds. Want to help? Click here to donate. Pete and Jen Emery, and their two sons, live and serve in Quito. Pete grew up and Quito and the family has a deep desire to help local people rise above their circumstances. Follow ER on Facebook and you’ll see posts of Jen leading the Quito Women in exercise, the chicken dance and even boxing – all with the goal of increasing their health and self-worth. Pete also leads short-term teams in Quito. Sign up for their newsletter by contacting Pete at pemery@extremeresponse.org.